A new addition to the blog is a 'Meet our Members section' which will be updated every week. 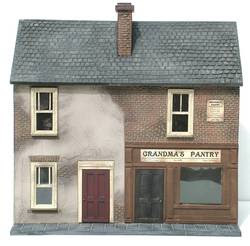 Petite Properties are 'one off' dolls house creations, handcrafted in the highly collectible 1:24th scale. Each property is individually designed and crafted by a professional 'architectural artist' to ultimately form part of an exclusive collection. Petite Properties are ideal for both the serious collector looking for that 'something different' or for miniaturists looking to experience the delightful 1:24th scale for the first time. REALISTIC BRICKS!!! All Petite Properties: Dolls Houses, Shops, Shop Boxes & Fireplaces in both scales - feature an exclusive handcrafted brick or stone detailing that has both the look and feel of the real thing! !...giving that all important authenticity & realism!! 1:24th Series of 'How to...' books - Available now! Do you want to make effective and realistic 1:24th scale furniture, but don't know how to get started? Do you want to bring your Petite Property interior to life and fill it for little or next to no cost? …then look no further – we have the solution! All projects are achievable without the use of any hard wood or woodworking skills, nor will you need expensive specialised materials…intrigued???? …You won’t fail to be inspired! Getting to know the members on a weekly basis...and quite rightly our "Creator" should be first in the spotlight! I don't know how you make those teeny houses though!